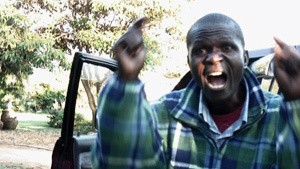 Mugabe and the White African is almost as good a documentary as you’ll see at a festival. The subject matter is outrageous and the filmmaking, in spite of an opening-title apology for the picture quality, is excellent and well-shot. A white farmer, Mike Campbell, who bought his farm in Zimbabwe 20 years ago, is now threatened with eviction by president Robert Mugabe’s government and thugs. “Zimbabwe for Zimbabweans” they say, meaning to kick out imperial-era Europeans. But Michael and his family consider themselves Zimbabweans and Africans. They are of European descent with white skin, but they purchased their farm; they didn’t claim it in the name of Queen Elizabeth II. The movie takes place during their years-long wait for their day in a pan-African multinational court. The Mugabe government is shameless in their attempts to delay the trial. A long legal battle gives Mugabe’s thugs more time to try to scare the Campbells off their farm. In fact, as they wait, more and more of their white friends leave, unable to handle the stress of death threats, vandalism, and hostility. Returning home from yet another postponed hearing, Campbell finds several black men in an expensive SUV in his driveway, claiming that they have taken ownership of his house. It’s a disgusting display of arrogance when the SUV driver, who refuses to say his name, blames Campbell for all the crimes of every white person who ever set foot in Zimbabwe. Here’s a man in a brand-new SUV who claims to be the brand-new owner of Mike’s house, having done nothing more than show up with an attitude. Next to him is white-haired old Mike in his dusty red pickup, having lived and worked the land for decades. The arrogance of the man with the sense of entitlement, who dares claim to be the aggrieved victim in all of this, is appalling. Mike, to his credit, handles the situation much more calmly than the festival audience. The other displays of hubris — the ones in the courtroom — are just as disgusting. Mugabe’s lawyers pull some unbelievably immoral and unjust tricks, apparently unaware or unconcerned that cameras are watching. At one point Mugabe’s lawyers simply leave the courtroom, leaving the astonished judge no choice but to rule against them. You wonder whether these lawyers are able to sleep at night. Do they feel any pang of regret? Do they have any idea that they are dedicating their lives to injustice? Where does their comfort come from? What motivates them? Is it is as simple as being well-paid? Or is there some twisted philosophy underneath that lets them think they are doing good? The sense of outrage and injustice in Mugabe and the White African is (obviously) its strong suit. 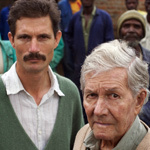 This is an engaging and emotional movie, supplemented by some very good photography of rural agricultural Zimbabwe. Unfortunately, a title card at the end of the film makes the entire prior 90 minutes moot, and I won’t say how. But after such an emotionally involving film, perhaps the update would have been better to left to the web site and not the closing credits — not that I advocate any sort of dishonesty in my documentaries. I just wish I had a little bit longer to let the power of Mugabe and the White African sink in.